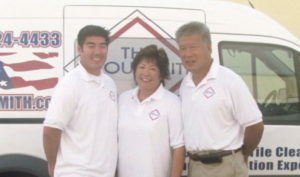 Dave Goka and his wife, Jan, a former franchise broker opened a Groutsmith franchise of their own in 2012. It was the first Groutsmith location in California. Since opening their franchise, the Gokas have established themselves as a household name in the San Diego area. Word-of-mouth referrals have led to steady, dependable business growth year after year. Dave and Jan had no prior experience in grout and tile service. Everything they learned was taught through a two-week training session and experience in the field. The Gokas have expanded to a second territory, which their son now covers. Eventually, Jan and Dave plan to hand the entire business over to him. Jan and Dave Goka, like many Groutsmith franchise owners, would have never guessed they’d own a grout and tile business had you asked them years ago. Neither of them had any experience in cleaning and restoration. Jan had worked as a legal secretary, administrative director, and franchise broker. Dave was a sales professional. As a franchise broker, Jan first discovered The Groutsmith as an opportunity for others looking to buy a franchise. But always keep an eye out for business opportunities herself, she quickly realized The Groutsmith was the opportunity her and her husband had been looking for. 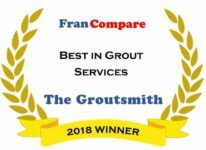 Unlike other franchises, The Groutsmith had the two huge advantages others didn’t: low startup costs and established systems that made it easy for first-time business owners. Interested, they struck up a conversation with the corporate team and it was clear right away that this wasn’t just another company promising the world. It was positioned for growth and gave its franchisees access to a business model that could get them on their feet and running quickly. Most importantly for the Gokas, it was a business they could one day hand off to their son, Grant. After deciding to move forward, Dave and Jan flew to The Groutsmith’s headquarters in Sarasota, Florida for training. Stepping off the plane, neither of them knew the first thing about grout or tile. But after two weeks of hands-on training, including shadowing the Sarasota team in the field, they arrived back in San Diego––as Dave puts it––“experts” who were prepared to bring a new service to a hungry market. Spouses thinking about owning a business together often worry about what it could do their relationship. But with many spouses like Jan and Dave happily growing their businesses together, The Groutsmith is an example of how arranging a business the right way is half the battle. As Dave explains below, building a business alongside your spouse means making sure each person’s role is separate but complementary of the other. For the Gokas, Jan puts her admin skills to work in the home office while Dave uses his sales skills to do estimates and manage cleaning and restoration out in the field. For the Goka family (and other Groutsmith owners), one of the biggest deciding factors for investing in this business is the model that lays everything out from day one. Long before The Groutsmith was a franchise with locations all over the country, it was a single business in Sarasota. During this time, its founder, Jonathan Smith perfected the business model, writing everything down each step of the way. Today, that process is handed to all new Groutsmith owners to help them get up and running–– and grow–– as quickly and sustainably as possible. Dave’s favorite part of being a Groutsmith owner is one you might not expect would be at the top of a business owner’s list: the instant gratification of starting and finishing projects the same day and hearing the reaction from homeowners. When asked whether there was anything we wished he’d done differently with the business, Dave simply says he wishes he’d had the drive earlier in life.